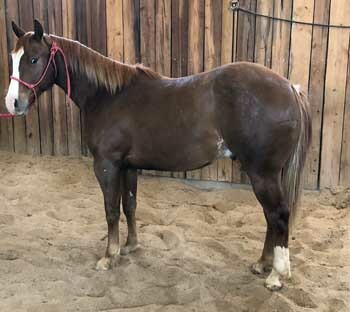 This is a good headed, flashy sorrel gelding that is an easy mover and has worlds of potential. He has a flaxen mane and tail with roan hairs throughtout his body and white in his tail, and a long hip. His dam HR PLAYGIRL PEPTO placed in an earlier HPRBA Futurity. Halter broke, gentle and sound. AQHA Ranching Heritage and 2019 HPRBA Futurity Eligible.